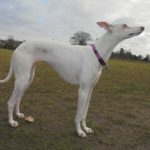 This dear little Sighthound girl, mainly white with a few fawn markings, is between the size of a Whippet and a Greyhound estimated to be age 2. 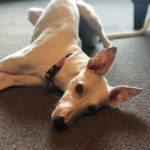 She came into the care of AfG in December 2018.She had been left in a stray pound after being found abandoned in a badly neglected state in Romania. Her physical and mental health has continued to improve steadily with the expert care and dedication of her very experienced foster family. 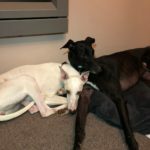 Also having the company of a rescued Greyhound and a rescued Lurcher to share her home with has helped her greatly. 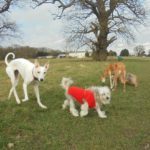 Blossom is a happy fun loving highly intelligent little hound. She loves to play and is very good at recall and retrieving a ball. She shows no prey drive, so non reactive to cats or even to the several Guinea Pigs she shares her home with. She is good with all dog breeds large and small and just loves to interact and play with them. She still has 3 meals daily which will eventually be able to be reduced to two a day. Blossom is used to a routine of exercise early morning, lunchtime walk and evening exercise and is used to being left at home for up to 3 hours. She is house trained walks well on a lead and travels well. 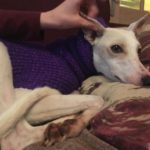 Blossom will need a home with the company of at least one other dog, of any breed and who will be happy to interact and play with her. 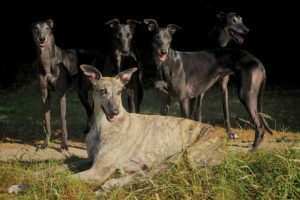 She is good with all people and children and will prosper in an active home.